The actions of the Trump administration concerning the Palestinian people have become more shameful by the day. In December, President Trump announced his intention to fulfill his ill-guided campaign promise to move the American embassy to Jerusalem, gifting Israel a de facto recognition of the Holy City as its capital. Not only did this declaration fly in the face of settled international law and countless United Nations Security Council resolutions which the U.S. supported and voted for, but even more so, it was a slap in the face to Palestinians, who have as much, if not more, of a claim to that city as any other group. In the months following his Jerusalem announcement, Trump followed up with exactly zero policy pronouncements regarding the Palestinian dilemma. And this week, he dispatched his daughter and her husband to Jerusalem to celebrate the transformation of the American Consulate in Jerusalem into the United States Embassy. Previous American administrations had avoided this ridiculous ceremony in order to prevent the exact consequences that actually developed that day. Since March 30, Palestinians in Gaza have been peacefully protesting near what Israel considers its border in what they have dubbed the “Great Return March.” Upwards of 70 percent of Gaza’s 1.9 million residents are refugees, hailing from ancestral villages located only miles from their current refuge. Moreover, Gaza has been labeled by the majority of world leaders and human rights groups as an “open-air prison.” Its inhabitants are trapped, denied access to basic services and mobility by their Israeli and Egyptian captors. On May 14, the day of the dishonorable Trump-Netanyahu “celebration”, the heroes of Gaza once again marched bravely for their freedom. And their shouts for justice were met by what they are always met by: Israeli state terror. Sixty Palestinians were murdered by the Israeli military, including an 8-month-old Palestinian girl, Laila al-Ghandoor, and a disabled man in a wheelchair, Fadi Abu Salah. The Israelis, in flagrant violation of international law, used live ammunition on defenseless, unarmed civilians. Most of the world took notice. France condemned Israel’s aggression. 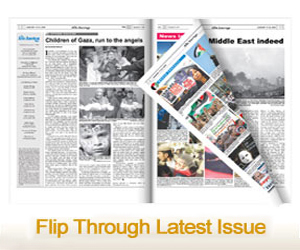 Great Britain, China and the U.N. secretary-general all called for an independent inquiry into the Gaza murders. The international Criminal Court opened an inquiry of possible war crimes committed by the Israelis. Sadly our government, once again, acted disgracefully. Deputy Press Secretary Raj Shah announced to the world that the Palestinian people were to blame for their own murders. In fact, the exact opposite is true. No nation has acted with the level of illegal violent hostility toward unarmed civilians in the fashion Israel has, time and again. Israel has no regards for international law. After Haley’s remarks, Palestinian envoy Riyad Mansour took to the floor to express the sentiments of the Palestinian people. 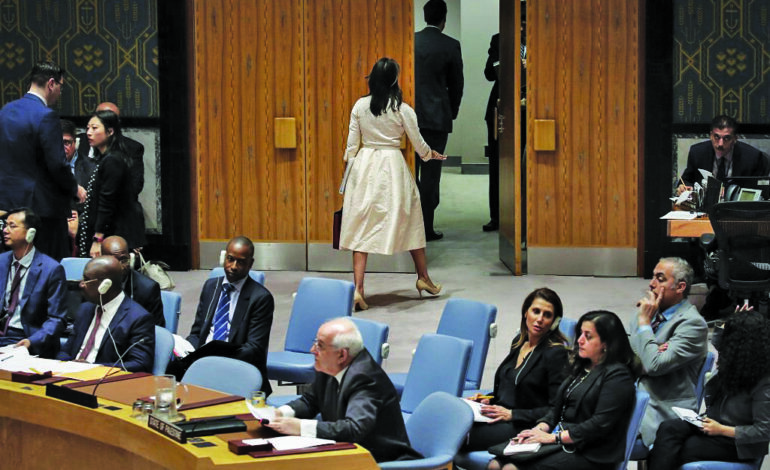 In a contemptuous, immature and insulting move, Haley walked out of the room, in effect telling the world that the blood of Palestinians, including that of the innocent Laila, was not worthy of even the least bit of American respect. We have become accustomed to American officials excusing just about every Israeli violation of international norms and laws. But this week, we witnessed our country’s highest officials spit on the graves of a people begging for freedom. Shame.